Was listening to Blondie today and it reminded of the time I met Deborah Harry. Many years ago I worked in a record store and one of the perks of the job was getting free concert tickets. Many of my tales about meeting people will have come benefit of these free tickets and there were a few. As it went whenever there was a concert at a club in town my friend and I took turns going to the venue directly after work to be the first in line to get front row seats or the next best thing. 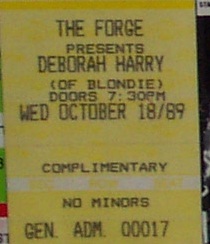 Well on one of these occasions I was sitting outside a club called The Forge waiting to get in to see Deborah Harry. So there I am sitting on the sidewalk and I look up from my book and Deborah Harry walks by and as I watch her walk down the street I think why didn't I say something but then what would I say. Hi I'm a huge fan and can't wait to see your show tonight! Like she hadn't heard that about a million times. I generally don't like to bother people but this was Deborah Harry and I am a big fan. I thought to myself opportunity lost, oh well. Luck was evidently on my side that day as a few minutes later she came walking back up the street. I wasn't about to let the opportunity slip by again so as she came closer I worked up the nerve to say hello and ask for an autograph. She said hi and then her assistant said they were in a hurry and she would sign something for me if it was quick. 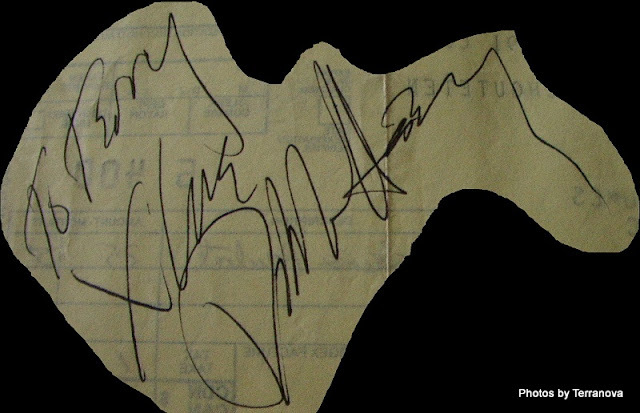 Well believe it or not I did not even have a slip of paper in my purse for her to sign all I had was a visa receipt so I pulled it out and had her sign the back. I thanked her for stopping and went back to waiting for the doors to open. I sat there thinking how cool was that I just met Deborah Harry. Boy was my friend jealous when she showed up and found out what had happened. The show was awesome of course and extra special because of the fact I got to meet her. Good times were had by all!